By Xah Lee. Date: 2016-10-13 . Last updated: 2019-02-18 . The Microsoft Natural keyboard, a revolution in keyboard. The Microsoft Natural Keyboard, introduced in 1994. 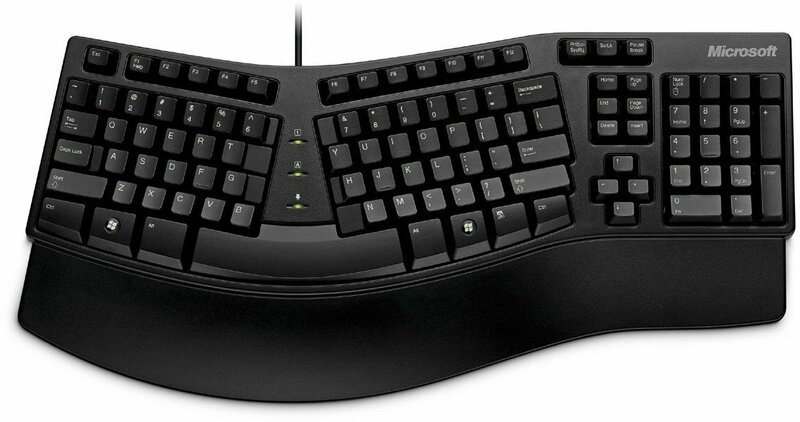 This keyboard made ergonomic keyboard popular, and also innovative is integrated wrist pad. The keyboard also introduced the ❖ Window key and ▤ Menu key for the first time, for Microsoft Windows 95. It was designed for Microsoft by Ziba Design. Although it was not the first ergonomic keyboard, it was the first widely available sub-$100 offering. The keyboard gained popularity quickly, selling over 600,000 per month at its peak. As with most Microsoft keyboards, software (Microsoft IntelliType) is bundled for both Mac OS X and Windows, allowing users to customize the function keys and modify keys fairly extensively. The Microsoft Natural Keyboard Elite, introduced in 1998, discontinued around 2014. The new arrow key arrangement sucked major. There's a big distance between the up and down arrow keys, very bad. Try play Pacman with it. Also, the vertical home/end key cluster is unsettling. The second iteration was the Natural Keyboard Pro, introduced in 1999. The Natural Keyboard Pro retained the original inverted-T layout of the cursor keys, and gained a row of program shortcut keys along the top edge of the board, including multimedia keys and Power management keys. In versions of Windows prior to Windows Vista, Microsoft's Intellitype software is required to configure the behavior of the shortcut keys. Vista and Windows 7 have the ability to customize shortcut key behavior without additional software when using the “internet keyboard” keyboard layout. Some other modern operating systems, such as FreeBSD and most Linux distributions, have comparable configuration options. The Natural Keyboard Pro also included an internal two-port USB hub, which was commonly used to connect other input devices such as a mouse or trackball, but this was dropped in subsequent iterations. This keyboard is nice. The multimedia keys, in their distinctive shape and size, are nice. Easy to recognize, easy to press. I used this one for 5 years. This, a significant redesign. But, overall, may be worse. The multimedia keys, and extra launch buttons at top, are worse. Now they are the same shape, harder to distinguish by sight or by feel. The button tactile quality is also worse than the previous version. Now they are harder to know if registered. Added a new zoom button in middle. Nice. Added a browser back and forth buttons, below the space bar. Nice. There's a critical problem: the space bar is very strong resistance. Then, still later, i got more hand semi-pain, and i suspect it's due to the Stiff spacebar. 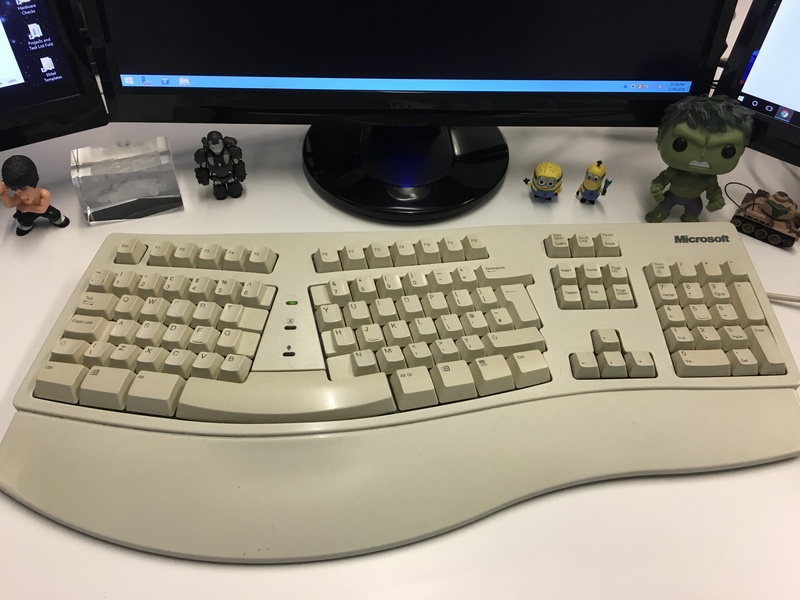 I went back to the previous keyboard, but soon got Truly Ergonomic Keyboard.